Enhance your flat footwear collection with this unique design from Gamins. 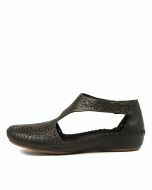 A lovely, laser cut take on a T-bar, this shoe has two open side panels with a hook and loop fastening for convenience. The slight wedge sole offers a comfier and more supportive fit, making this shoe ideal for busier days.